Did you know that the majority of fairs held in the UK can trace their ancestry back to charters and privileges granted in the Medieval period? It wasn't until the 1860's that the more modern fairground that we are more familiar with, came into being with the introduction of steam-powered roundabouts. By 1891 the Carousel was introduced and more than 120 years later we still all love the fairground with it's crazy games, rollercoasters and candy floss and Ladbrokes have captured the fun and atmosphere perfectly with their aptly named online scratch card, Fairground. You can buy a card for a minimum of £1 where the top prize is £1000. If this doesn't quite float your boat and you would like to spend a bit more then you're in luck as this is one of the few cards designed to cater for the high-rollers as you can actually play for £250 a card! Crazy right? Of course the jackpot increases in line with cost so there is a whopping £250,000 up for grabs at this level. 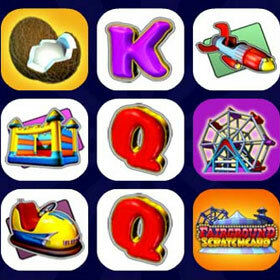 Fairground also includes two bonus rounds – Coconut Shy and Shooting Ducks – both of which can help you boost your winnings. So if you’re a fan of the fabualous fairground you are sure to enjoy this card! 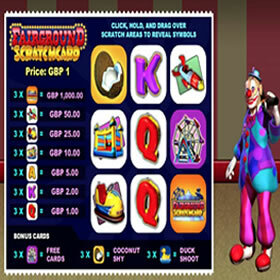 Play this scratch card and many more like it at Ladbrokes Casino. 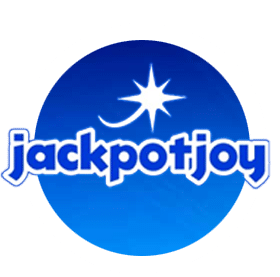 Along with scratchcard games they also offer a great range of bingo games including Britains Got Talent and Rainbow Riches Bingo. 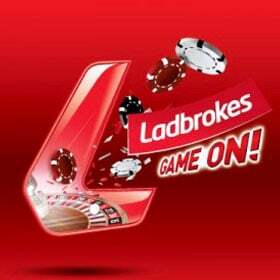 Ladbrokes give some of the best Promotional offers available – check out their latest exclusive offer below.